The classic hand game of Rock-Paper-Scissors has a shadow side — quite literally. It’s played partially in the dark. Each move casts shadows on the wall. And the rules are reversed to whimsical results. When the scorekeeper initiates darkness, each player opaquely forms one of three hand gestures in front of the lamp. At the count of three, the scorekeeper lets there be light, and the gesticulative shadows are writ large on the wall. The so-called Rock is actually a Paperweight. The so-called Scissors are still cutting blades, but let’s call them Snippers just to be different. Paperweight sensibly covers the Paper Doll and the Paperweight wins. Paper Doll is born of the Snippers and the Paper Doll wins. Paperweight *sharpens* the Snippers and the Snippers win. 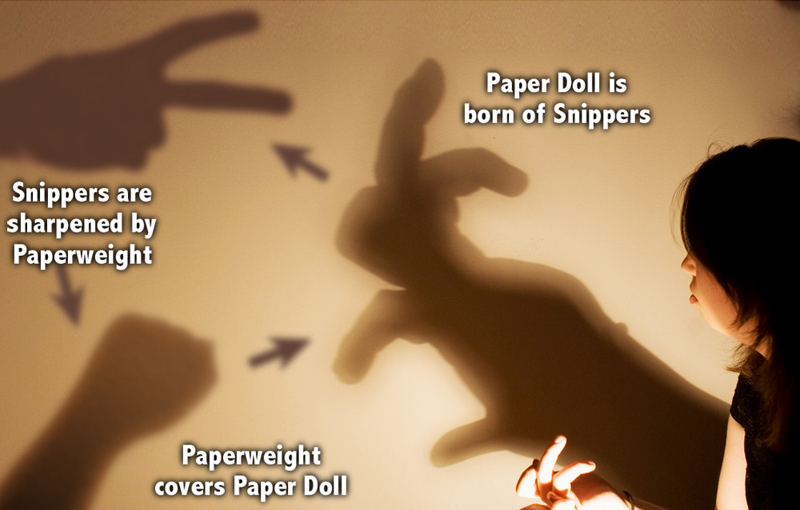 As a mnemonic, Snippers *need* to be sharp in order to fulfill their destiny, Paper Dolls *need* to be snipped in order to take shape and fulfill their destiny, and Paperweights *need* to rest upon Paper Dolls because everyone requires downtime to flatten out, relax, and recharge so as to fulfill their destinies.